Egyptian actresses were at the forefront of the uprising against Mohammad Morsi and the Muslim Brotherhood this week. Egypt’s glamorous female icons were at the forefront of an uprising that led to the ouster of Islamist president Mohammad Mursi and his Muslim Brotherhood group from power. Activist groups and opposition political parties have long been credited for driving mass rallies in Cairo, but the role of television and cinema stars was seen as a powerful force this time. 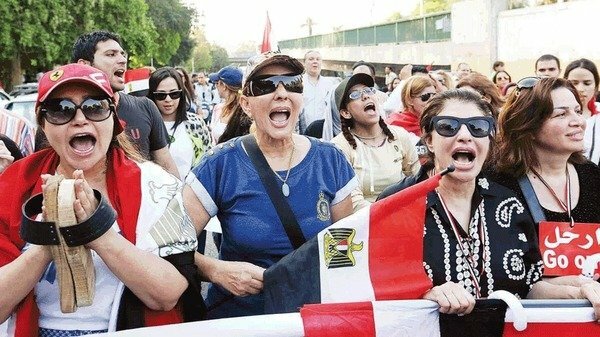 In a country where cinema and the entertainment media play a major role in people’s daily lives, major television faces, especially women, took to the streets on June 30 pulling with them crowds of fans to say “out” to Mursi. Prominent Egyptian actresses Athar al-Hakim, Laila Elwi, Nadia al-Jundi and television figure Hala Sarhan all signed “Tamarrod” (rebellion) campaign , which collected 22 million signatures to overthrow president Mursi. Figures in Egypt’s media and entertainment industry have long complained about restrictions to freedom of expression imposed by Islamists in power. Meanwhile, in Hollywood, idiot leftists are still supporting Barack Obama’s all-out assault on America.